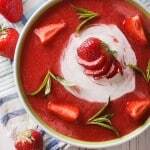 Strawberry Soup Recipe - Only 205 Calories! 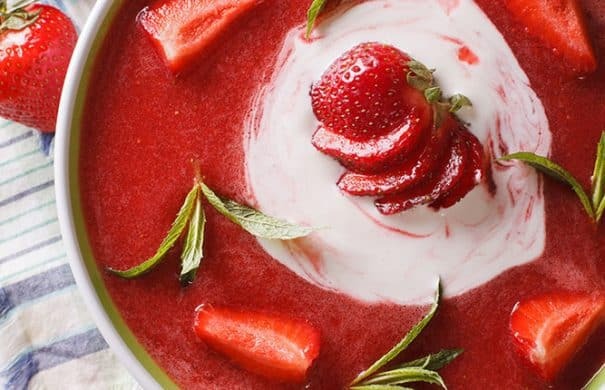 It’s a perfect time to be picking fresh strawberries from your garden or buying them at the farmers market, so I am using 8 cups of fresh berries for this tasty strawberry soup. Throw everything into your blender, chill for a couple hours and then dinner is served. I love this chilled as a Summer soup, but if I’m craving fruits in the Winter, I will put it on the stove top and warm it up. Served with some crusty bread, it’s always a perfect meal when I have the Winter blues! Don’t you love how simple it is? And don’t you love how pretty this soup this? Yogurt and orange juice are both blended with the soup to give it a creamy texture. You can use vanilla or strawberry yogurt depending on if you want to make this extra strawberry or not. 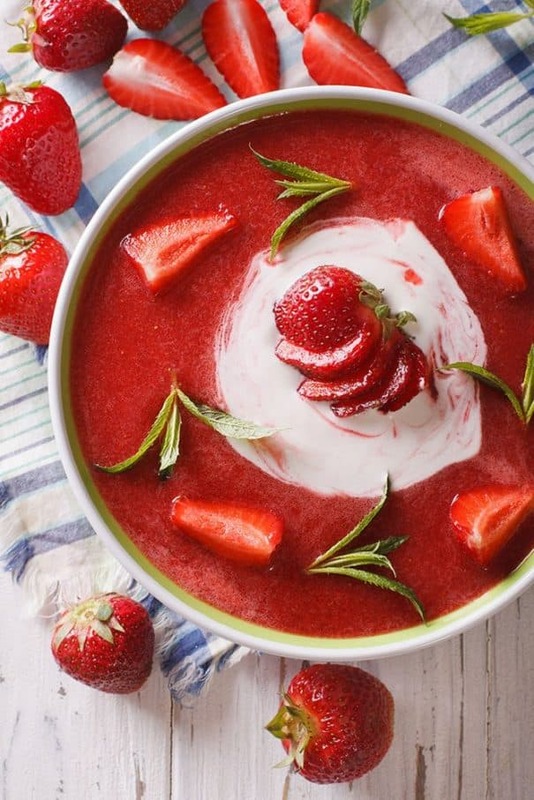 This Strawberry Soup is a healthy option for a meal as each serving is only 205 calories. This soup will make 4 servings. 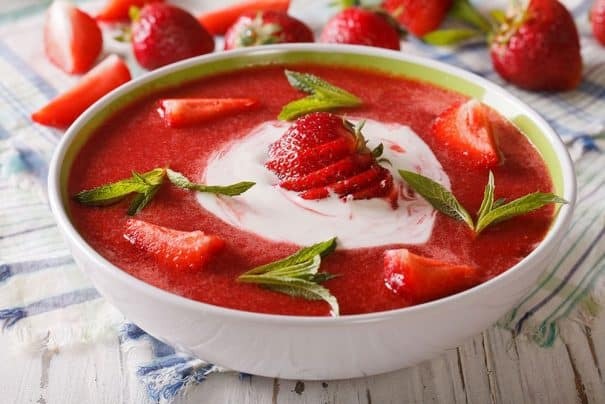 Hope you enjoy this easy Strawberry Soup! Add all ingredients to the blender except the fresh mint. You might need to do this in batches depending on the size of your blender. Blend until everything is creamy. Place in refrigerator and chill for at least 2 hours. Serve in bowls and add fresh mint leaves on top. This has SO been pinned!! I can’t decide if I want it for breakfast, lunch, dinner, or dessert, but I’m thinking breakfast for now 🙂 It’s so beautiful! This is gorgeous. When would you serve this soup? Hey Mimi, this makes a perfect Summer soup for lunch or dinner. If you serve for dinner, I’d serve alongside a beautiful salad and/or some fresh bread and cheese. This looks and sounds so refreshing…I want to dive right in. What a good idea Pamela!! I can honestly say I’ve never tried cold soup. I love this idea!! Perfect for people like me who hate burning their mouth 😉 How delicious! So pretty and perfect for this time of year when strawberries are on sale for buy one get 2 free! I made this and because of the yogurt, it doesn’t look as clear as yours…more of a creamy look. Should I have used less yogurt? I also used fresh ginger, minced because I had some already. It’s chilling in the fridge right now. Smells delicious. Thank you! Hey Tricia, I agree about the smell – it smells amazing! For more of a vibrant color, you could add less yogurt or more strawberries…. either way the taste is going to be delicious! Enjoy! I have never tried a fruity soup, but this is so pretty and would be amazing in summer. Yumm! looks amazing…..thanks for sharing on craft schooling Sunday, great to see you! What a lovely soup, thanks! This soup looks so pretty and delicious. Loving the vibrant color of this soup. Can’t wait tor try it. This is such an interesting concept! I think I might give this a try sometime this summer! Fresh Scottish Strawberries are in the shops now! Your recipe just came at exactly the right time Pamela. Thanks! Great recipe! I live in Finland and fruit soups are HUGE here, like a way of life. And for sick days fruit soup to them is like chicken soup to us. Good stuff! Oh yum!! I might add in some chocolate chips to my soup… because chocolate. 🙂 Thanks for sharing this gorgeous summertime soup! I have had fruit soups on cruises, but have actually never made one. This looks like a good one to start with, especially since I love Strawberries. Thank you for sharing on Grandma’s House link party. Shared and pinned. Mmmm! This sounds absolutely delicious! Is that creme fraiche or just cream mixed on top? Thanks so much for sharing at the #happynowlinkup! 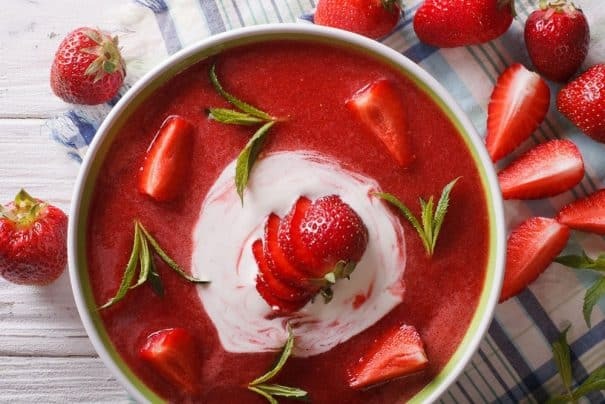 I’ve never seen a strawberry soup recipe, but after seeing yours, I want to try it. Thanks for sharing at Snickerdoodle. Pinning. Wow, this soup looks super delicious! Thanks for sharing with Pretty Pintastic Party. I have never heard of these before, I would love to taste it!! Thanks for sharing at Creative Mondays last week, you are one of this week’s features 🙂 Pinned too. Thank you for sharing this strawberry yumminess at TFT party. Pinned and featured, Hugs! What an interesting recipe! It looks delicious. Thanks for linking up for Friday Favorites. I’m featuring you this week. Your strawberry soup is a must try. Looks delish. Thanks for sharing at the inspiration Spotlight party. Pinned & shared. Can I substitute the strawberries for black berries in this recipe??? The blackberries in my yard are all ripe and I want to use them. I think you could definitely turn this into a blackberry soup by using blackberries instead of strawberries – I bet the color would be beautiful! Let me know how it turns out! as i sit here sweating, i saw the word “cold,” and latched on. this sounds delicious and that color!! Looks delicious! Was wondering about how many servings this would yield? Thanks! Hey Holly, approx 6 servings. Enjoy!